(SEE AVAILABILITY ABOVE FOR ESTIMATED DELIVERY) - Walker/Crutch Pads - Walker/Crutch Pads - Terry - cloth - covered foam pads. 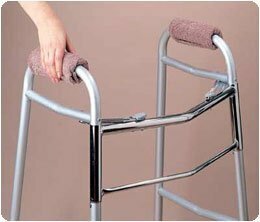 Secure to walker or crutch handles by Velcro fastener. Washable. Black. 6½" x 6¾". Packaged as a pair. Latex free. - Rolyan products are internationally licensed & manufactured for home & clinical use. Most of their products offer a lifetime warranty.